Two mostly generic Dark Irregulars appear, that fill your Soul and gain bigger stats too. AUTO: [Counter Blast 1] When this Unit is placed on (RC), you can pay the cost. If you pay it, Soul Charge 1, if there are 6 or more cards in your Soul, during that turn, this Unit gains Power+3000, and if you have 10 or more cards in your Soul, Counter Charge 1, this Unit gains Power+3000. CONT (RC/GC) GB1 Darkness: If there are 10 or more cards in your Soul, this Unit gains Power+5000 and Shield+5000. AUTO (GC): When an attack does not hit, you can place this card in your Soul. For Today’s card we’re introducing the following cards from the 11th Booster Pack “Rogue Deity Descent” (on sale June 9th, 2017), the 《Dark Irregulars》 cards “Big Shaker” and “Werkatze Recruit”. “Big Shaker” is an excellent Unit that Soul Charges and gains Power at the same time. When it’s placed on the field, at the cost of Counter Blasting 1 card, you can Soul Charge 1 card, and if you have 6 or more Cards in the Soul, you gain 3000 Power, and if there are 10 or more Cards in your Soul, it gains Power+3000 and Counter Charge 1! If you have 10 or more Soul, essentially you’ll Soul Charge 1 and gain 6000 Power without a Cost. Since it can increase its Power up to 15000, you’ll be sure to Hit with your attack. Also, it manages to satisfy the conditions for the 《Dark Irregulars》 clan ability 【Darkness】 at the same time. 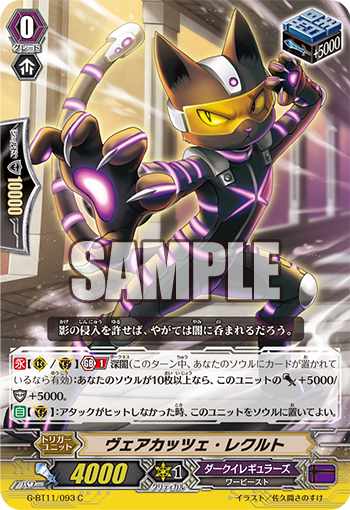 Also, the Stand Trigger “Werkatze Recruit” is a Unit that gains Power and Shield. During your turn if you have 10 or more Soul and you’ve achieved 【Darkness】, it gains Power+5000. Meanwhile, during the opponent’s turn, if you’ve achieved 【Darkness】, it functions as a 15000 Shield. by using “False Dark Wings, Agrat bat Mahlat” and this cards own ability to place itself in the Soul, to achieve 【Darkness】, it serves as a 150000 Guard. And, when your opponent’s attack doesn’t hit when it Guards, it can place itself into the Soul with no Cost or Generation Break. So you’ll be able to aggressively increase your Soul early on! Also, we’ll be continuing to introduce cards from the 11th Booster Pack “Rogue Deity Descent”! Please enjoy!